1.Combine the flours, salt, yogurt and water in a mixing bowl. You may add more or less water according to the thickness desired for the dosas. Cover and leave the batter for 15-20 minutes. 2.Heat 2 Tsp oil in a small sauté pan over moderate heat. Add mustard seeds. When they crackle, add cumin seeds, once the cumin darkens, add chillies, ginger, curry leaves and asafetida. Sauté until fragrant. 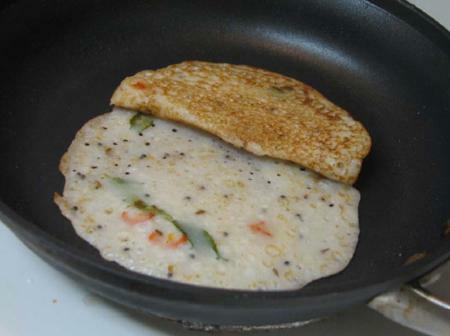 Add the tempering to the prepared dosa batter. 3.Heat an iron or non-stick frying pan over moderate heat. Pour ¼ cup of the batter or enough to cover the base of the pan. Spread the batter to a round shape disc using a flat bottomed ladle or cup. Drizzle some oil around the edges of the dosa and cook until edges turn brown. Flip the dosa over and drizzle some more oil and cook for 1-2 minutes. Flip again and transfer onto a serving platter. Serve hot with any chutney.